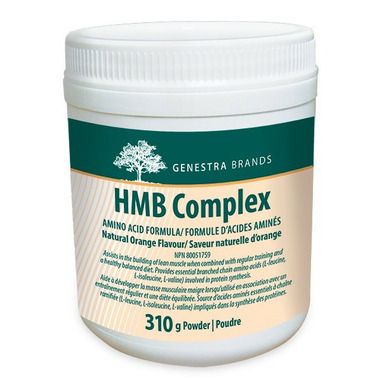 Genestra HMB Complex combines beta-hydroxy beta-methylbutyrate (HMB) with two amino acids (glutamine and arginine) involved in muscle protein synthesis, and three essential branched chain amino acids (BCAA); leucine, isoleucine, and valine. HMB is a leucine metabolite that is naturally formed within the body – a 70 kg person produces an estimated 0.2-0.4 g of HMB per day. HMB up-regulates protein synthesis in muscle cells, stabilizes the muscle cell membrane, and decreases skeletal muscle protein degradation. When combined with regular exercise training, HMB supplementation helps to increase both lean body mass and muscle strength. HMB’s effects on muscle mass may be dependent upon vitamin D status; in elderly participants, supplementation with an HMB/arginine/lycine mixture only improved muscle strength in participants with normal serum vitamin D levels (less than 30 ng/mL).